Which kills me, of course. Basically, the students are taught to identify the relevant formula, match the given information to variables in that formula, and solve for the unknown variable. Helpfully, all the given information will find its way into the formula somewhere. Helpfully, the practice problem will reference the relevant sample problem in case the student forgot the relevant formula. What we have here, essentially, is a compelling passage of conceptual development thoroughly undercut by practice problems which promote thuddingly linear and literal inquiry. Essentially, we have Holt tossing cupfuls of water onto a raging fire while Rinehart and Winston dump gallon after gallon of gasoline onto it from the other side. I mean, we aren’t even pretending to prepare our students to apply this stuff creatively, to the world around them. Because out there, in the world, no one will helpfully tell them what chapter of the book they’re looking at, no one will helpfully reference the relevant sample problem. As an English teacher (and even though my school says that Social Studies teachers are in charge of writing, not English teachers), this makes sense to me. I know that none of our students are, most likely, David Foster Wallace or even Stephenie Meyer, but nobody told them how many paragraphs they needed to write. The more we mandate dumb things, the more dependent our students will be on said dumb things. I think there’s a very clear parallel between your awful word problems and our terrible writing assignments and the teachers who require 100 notecards per research project. I agree. It has been a battle to get kids to think and make connections. We used a google form to gather results on a lab from 6 classes of students. They were stymied by the fact that we did not tell them specifically what data they should look at or what specific kind of chart they should make. “should we take notes” I hear all the time as well. They are going to college. They should not be asking that kind of question. They are starting to make progress and be more self-directed but it has been a tough process. Unfortunately, it is not done enough and in every class. Most teachers lament the inability of students to think and how they have to “spoon-fed” information. It is too tough to teach them otherwise, they say. That is exactly the reason why we need to. You are confusing inflexible knowledge with lack of conceptual knowledge. You can’t really teach conceptual understanding directly. See Willlingham and you can’t avoid the uinflexible knowledge. stage either. It’s the path of least resistance. How many times have we had a student say, “I have a question” and then follow it up with “I don’t get it” (code for “do this for me”) –to which I respond “I believe you; now what is your question?” Do you think that often times we feed this mental laziness by saving these helpless handraisers (h/t Fred Jones) by doing more than they do. I had the opportunity last year to spend the day going in and out of all the math classrooms in my department observing. My conclusion: our teachers are working way too hard. They are working and the kids are watching. I am not going to learn to play guitar by watching Dave Matthews but I can butcher Satellite a few times and eventually it starts to sound ok.
BTW, Dan, have you managed to track down any copies of the CPM books? I am working on acquiring some myself. Teaching needs to be more about putting students in situations where they can learn (I think Einstein said it well) rather than forcing them to do specific work. Teachers need to be there to introduce students to the relevant material and help them as they struggle along the way- not simply force students’ noses into their books. Once you’ve gone over how to do a specific skill set (i.e. use formulas to find information about an object’s projectile motion) students need to be challenged to make sense of how that looks in real life (i.e. design and build a catapult that can fire a tennis ball the greatest distance). I believe Dan has brought the topic of asking good questions. That is, what kinds of questions should teachers ask (or present) and how to train students to ask good questions higher than Bloom’s bottom two levels. As students learn to ask good questions they are then open to, perhaps, answer those questions and/or find the answer to those questions on their own, either on the internet, an expert like a teacher or tutor, a text book example, or draw upon their own experience or notes. Hence, students develop an intrinsic motivation of mathematical exploration and investigation. The problem really is, that many students have been spoon fed so much that they can no longer articulate questions about effects or observations of phenomena, so how can we even expect them to find causes of certain things like production of energy by lifting or holding weights? We need to retrain or recondition our students. Dan, I believe, is attempting to find the most efficient and effective way to rekindle student’s curiosity of the world around them through a mathematical lens. Perhaps just using text book questions extinguishes curiosity rather than kindling it. I appreciate Dan’s effort to change the status quo. I appreciate all of Dan’s commenters for their excellent input to this blog’s wonderful conversations on improving student and teacher learning. You are all awesome! David, I really like what you wrote. You have inspired me to make a new classroom rule: You are not allowed to say “I don’t get it”. If you have a question, you must be specific in what you ask for. You are right. Be less helpful. Learned helplessness is our fault not the student’s fault. I think it creates a age group of kids who feel useless and unnecessary to society. I know that’s a leap, but over the years, that what I have observed. I think kids ask these questions because we grade them on so many details. So, they want to get the details right, and in this, lose the big picture. That’s why I struggle with grades on line. We want to give enough grades to support the final grade, but that means everything becomes a grade, which, I think, pushes kids to want to know EVERYTHING before they begin. Grades can interrupt the process of discovery, the process of learning. that many students have been spoon fed so much that they can no longer articulate questions about effects or observations of phenomena, so how can we even expect them to find causes of certain things like production of energy by lifting or holding weights? How do you know that, though? How do you know the problem isn’t, rather, that students have often been taught so poorly in the past that they have no expectation of success unless it’s a situation where they need only put in minimal effort? And therefore avoid academic challenges like the plague? How do you know that’s not where their “learned helplessness” comes from? I like the idea of “be less helpful,” if you mean something like:once you have made sure that your students have mastered the necessary underlying skills, then be “less helpful while still controlling enough of the variables to 1)make it very likely that your students can be successful in a reasonable amount of time and 2) be able to figure out what went wrong for students who aren’t successful. Which is what it sounds to me like Dan is doing (one twenty-thirty minute diversion/open-ended challenge per week, while still keeping close tabs on skill development). Before working on being “less helpful,” I would want to first make sure that I actually know how to be helpful. I’m a physics teacher. I rarely use the textbook. I don’t like the way they are written, for the most part. I often steal the questions and problems from them, however. I have to admit I am unfamiliar with the Holt/Reinhart/Winston book. To me, HRW means Halliday/Resnick/Walker, a treasure trove of questions and problems perfect for AP Physics C.
Anyway, many of us do not rely on the textbook to do our teaching for us, and I would venture that the majority of students do not read the textbook anyway, so how they are written does not particularly matter. I think this response, assuming that this was your only response, might well be the opposite problem to the one Dan worries about. Do your students know what it means to make a point elegantly in the first place? Do they know what sort of variation in length you will tolerate? Eg would you give a top-notch mark to a paper with only one or two sentences in it? And even if you would, they might well have encountered teachers in the past who wouldn’t. How do you know that no one ever told David Foster Wallace or Stephanie Meyer how many paragraphs to write when they were learning how to write? Or that if no one did, that they wouldn’t be even better writers if some teacher had? (I have not read Stephanie Meyer’s work, but I have read a number of popular writers who were less than astounding). Perhaps as mature writers they did not need someone looking over their shoulder telling them how to write, but what someone experienced can do is different to what someone inexperienced can do. If you have a student who is too long-winded, a maximum number of paragraphs/pages/quotes can be useful in shaking up their skills and forcing them to concentrate on writing conscisely. If you have a student who is too brief, a minimum number of quotes can be a useful tool in forcing them to go into more depth (though I would be more worried here about the student just resorting to padding). Yes, true, absolutely. Of course I wouldn’t give a top-notch grade to an essay with only two sentences–I don’t assign essay questions that can be answered with only two sentences. The way I have my students write, when I can get away with it–I apparently don’t work for the writing department anymore, according to the state–is that they constantly revise. They write a first draft, then a second, then on and on. Infinite drafts (until the due date) with meaningful and transformational revision on each one. I try to slow them down–real writing takes time and thought–and the end results have been, so far (I’ve been using this approach for two years now) very encouraging. Not every student becomes E.B. White, or even Stephenie Meyer, but every student’s written work is a hell of a lot better than it would’ve been (yep, I’ve run some control assignments as well). It worked last year and hopefully has worked this week. I’m tired of students thinking that an essay has one intro paragraph, three body paragraphs, and one concluding paragraph. I’ll admit that I’ve bought completely into Paul Graham’s views on this. 100%, like. The sooner we can rethink what “essays” really are, in a school context, the sooner we can actually talk about how to teach writing. Until then, we’re teaching something else entirely, then getting frustrated when we read our students’ craptastic papers. It’s nice to see a shout-out to physics here. I think the question about weight lifting is more open-ended and requires more thought than the latter question about bowling balls and ping pong balls. When I first read it, I was reminded of the dread I used to feel at doing problems like that because I actually had to think! Solving the more formulaic problems is a skill that me and my fellow students exhibited in high school and also in undergrad mechanical engineering classes. In some sense, it’s like doing your taxes; subtract the value of line 35 from line 36, but with algebra or calculus instead of addition and subtraction. It’s a useful skill to have because there are many problems that have been solved, so that one just has to figure out how to “plug and chug” with the given problem. The bigger challenge is figuring out which equation is appropriate, and this can be missed when there aren’t more open-ended problems. One way I’ve seen tests measure this is when they give problems with “tricks” that can be solved in multiple ways, but one way is much easier than the others. 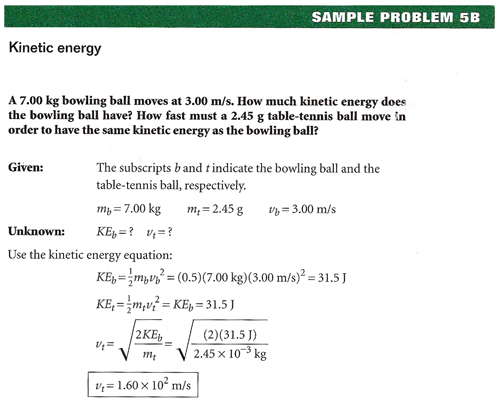 For example, you could derive the equations of motion for a ball rolling down a slope using Newton’s 2nd Law, but if you apply energy conservation, it may be much easier. I’m basically agreeing with Dan that this is an issue, but it’s not just an issue in high school; it makes its way into university as well. If you ever hear your students say “plug and chug” or ask for sample problems similar to the one on the homework, you should cringe. Perhaps more a digression than anything else, but have you checked out Paul Hewitt’s “Conceptual Physics”? If you have, what do you think of it? Jeff Wasserman – that’s good, particularly that you are running controlled experiments on your teaching method. I ran across this interesting article on teaching creativity http://www.goshen.edu/~marvinpb/arted/tc.html. The author appears not to have tested his theories, but they’re interesting ones. He argues in favour of teaching creativity by giving students tight limits – but lots of different ones. I think this fits with Dan’s various open-ended questions, or with giving students the odd essay to write in the format described. He also is strongly in favour of giving informative feedback like you do. Pingback: A message for school technology coordinators. Be less helpful. Hat tip to @ddmeyer.